PARIS, France, December 6, 2015 (ENS) – Global food, farming and environmental justice groups are joining forces to put biotech crop giant Monsanto on trial for ecocide and crimes against nature and humanity at the International People’s Court in The Hague. At a press conference held in conjunction with COP21, the United Nations climate change conference now underway in Paris, the groups announced their intention to try the publicly-traded U.S.-based transnational corporation. The trial is scheduled for next year on World Food Day, October 16, 2016. It will be held not at the International Court of Justice, but at the the International People’s Court, which operates outside the mechanisms of government and formal institutions like the United Nations. Its authority comes from the voices of the victims, as well as that of civil society, both national and international. 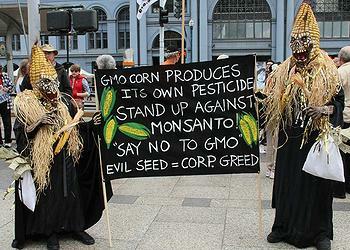 “The time is long overdue for a global citizens’ tribunal to put Monsanto on trial for crimes against humanity and the environment,” said Ronnie Cummins, international director of the U.S.-based Organic Consumers Association and Via Organica, based in Mexico, and a member of the Regeneration International Steering Committee. “We are in Paris this month to address the most serious threat that humans have ever faced in our 100-200,000 year evolution – global warming and climate disruption, said Cummins. “Why is there so much carbon dioxide, methane and nitrous oxide in the atmosphere and not enough carbon organic matter in the soil?” he asked. The case will be brought to The Hague by Organic Consumers Association, IFOAM International Organics, Navdanya, Regeneration International and Millions Against Monsanto, joined by dozens of global food, farming and environmental justice groups. Since the beginning of the 20th century, Monsanto has developed a steady stream of highly toxic products which have permanently damaged the environment and caused illness or death for thousands of people. • PCBs (polychlorinated biphenyls), one of the 12 chemicals governed by the the Stockholm Convention on Persistent Organic Pollutants, a global treaty to protect human health and the environment from chemicals that remain intact in the environment for long periods, become widely distributed geographically, accumulate in the fatty tissue of humans and wildlife, and have harmful impacts on human health or on the environment. 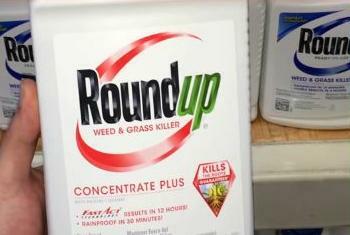 • RoundUp, the most widely used herbicide in the world. This herbicide, designated a probable human carcinogen by the World Health Organization, is used in combination with genetically modified RoundUp Ready seeds in large-scale monocultures of soybeans, maize and rapeseed for animal feed and biofuels. “Monsanto is able to ignore the human and environmental damage caused by its products, and maintain its devastating activities through a strategy of systemic concealment: by lobbying regulatory agencies and governments, by resorting to lying and corruption, by financing fraudulent scientific studies, by pressuring independent scientists, and by manipulating the press and media,” said Andre Leu, president of IFOAM and a member of the RI Steering Committee. “Monsanto’s history reads like a text-book case of impunity, benefiting transnational corporations and their executives, whose activities contribute to climate and biosphere crises and threaten the safety of the planet,” said Leu. 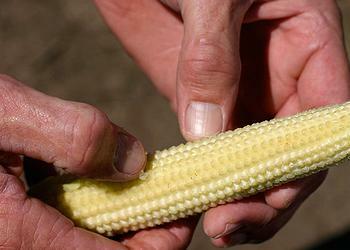 For its part, Monsanto portrays itself as a company that cares about the climate. On the agriculture thematic day at the COP21 meeting in Paris, December 1, Monsanto and other food and agriculture giants outlined their plans to make more food available for a growing population while reducing agriculture’s greenhouse gas footprint. Monsanto executives, together with those of PepsiCo, Olam and Kellogg Company, chaired a working group on Climate Smart Agriculture. They declared that by 2030 they are aiming to make 50 percent more food available and strengthen the resilience of farming communities whilst reducing greenhouse gas emissions by 50 percent. “Agriculture and farmers are uniquely positioned to make a real difference in driving climate change solutions,” said Hugh Grant, Monsanto’s chairman and chief executive. Climate Smart Agriculture has the support of organizations such as the World Bank, the United Nations and the UN Food and Agriculture Organization in addition to national government aid and development agencies. Monsanto has never lost a case in court, and has successfully sued farmers who reused the company’s proprietary genetically modified seeds without paying royalties, even in cases where organic farmers had sued Monsanto for the inadvertent cross-pollination of their organic crops with GMO seeds. Monsanto filed 144 patent-infringement lawsuits against farmers between 1997 and April 2010, and won judgments against all farmers. Earlier this year, the company pledged in a U.S. court that it would not press charges against farmers if its biotech crops accidentally mix in with organic crops. Nevertheless, on world Food Day 2016, an international tribunal of lawyers and judges will assess the potential criminal liability of Monsanto for damages inflicted on human health and the environment, relying on the “Guiding Principles on Business and Human Rights” adopted by the United Nations in 2011. The tribunal will also rely on the Rome Statute that created the International Criminal Court in The Hague in 2002. This court has determined that prosecuting ecocide as a criminal offense is the only way to guarantee the rights of humans to a healthy environment and the right of nature to be protected.